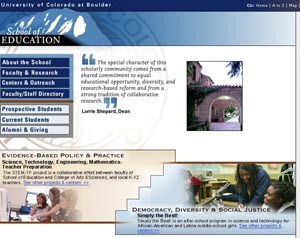 Faculty and students engaged in qualitative research in the School of Education at the University of Colorado, Boulder, focus on many different topics in education research, including gender issues, science and mathematics education, bilingual issues, human development, literacies, philosophy of education research, civic engagement, school reform, and youth culture. We conduct our research singly and in collaborations with undergraduate students, graduate students, and faculty. Our qualitative expertise spans a range of methods, including ethnography, discourse analysis, feminist analysis, narrative research, mixed methods, and policy analysis. Although much of our research is primarily qualitative, we frequently collaborate with our colleagues in quantitative methods to conduct mixed methods studies. We are fortunate to have strength in both qualitative and quantitative research and little conflict regarding the contributions of each. We offer graduate courses in Qualitative Research Methods (I and II), Ethnographic Research, Discourse Analysis, Narrative Research, Disciplined Inquiry, Philosophy of Education Research, Social Interaction Research, and Research on Youth. Our students commonly take additional methods courses in the departments of Anthropology, Sociology, Philosophy, Communications, Journalism, Ethnic Studies, and Women’s Studies.